I recently received the Educational Dice Bag from Joyce Herzog to review through the Schoolhouse Review Crew. I'm always interested in new (at least to me) educational products, and my kids LOVE to play games (don't they all? ), so this was right up our alley. 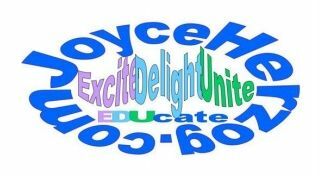 Joyce Herzog is an educator with 25 years experience teaching elementary and learning disabled students in both private and public schools, and has served homeschoolers for more than 25 years through her speaking engagements, the books she's authored, and consultations. She wants to help students learn as they learn best, according to their individual learning style. The Educational Dice Bag comes with three sets of dice: Alphabet Dice Delight, which includes a 30-sided alphabet die (all the letters plus four "wild" spaces) and a vowel die (AEIOUY); Rolling Math Games, which includes 1 die with numbers, one die with number words, and two dice with colored dots; and Deca Dice Math Games, which includes 1 deca die with numbers, 1 dotted deca die, 1 number word deca die, and 1 double deca die (a die within a die - so cool!). There is also a math operations die. Each bag contains instructions for simple games to play. The label says "fun for all ages," and that's certainly true. There is a game in there for everone. My children all enjoyed playing with these dice, but I used them most with my 5-year-old. Many of the games are just perfect for him at this age, and he loves to play with me. Once he's learned something, he loves to teach it back to me, so I got to brush up on my addition and alphabet skills, as well. :-) This is a quick, easy thing to get out when we have some time to fill while the girls are working. I gave Isaac a printed alphabet chart, and we played one of the recommended games, which has him roll the alphabet die with lower case letters on it, and match the letter that comes up with the corresponding upper case letter. He was really good at that game, and it was helpful for me to see that he does, in fact, know all of his upper case and lower case letters. The die also has a few "wild" spaces, so when that would come up, he could choose any letter he wanted. Turns out his favorite letter is "A." Take a look at that picture on the right. He rolled those dice and told me that added up to 7. I was so impressed! It's probably not that big a deal, but I was pleased to see that he could process dots and numbers together. He did put away the die with number words on it after I made him sound out and read "six" to me. I guess that was not in HIS rules for that game. 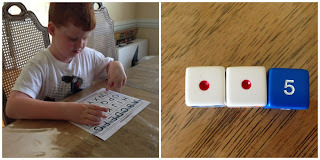 Once we have finished with the games I ask him to play, he loves to make his own fun with the dice. I have yet to find something that will not allow Isaac to bring cars into it somehow, and as you can see, his little trucks are excellent at hauling the dice away. There are games in here for older children, too. You can use the alphabet die to teach kids how to use the dictionary. How cool is that? The deca dice math games, in particular, would be challenging for older kids. There is even a game for practicing long division! I really, really like the dice and the game instructions. The games are simple, so not hard to figure out, but they teach great stuff. For example,the instructions encourage you to have students keep score using tally marks, and then learn to count their points by 5. That's a nice little trick for slipping in some extra skip counting practice. Connecting with my kids as we play together. The games are fun, and they give students great practice in important skills. The dice are portable! The instructions suggest keeping them in a small plastic container, and taking it with you to the doctor's office, etc. so you always have something to do. Isaac and I spend a lot of time waiting for the girls at their various activities, and it's been fun to play dice games while we hang around at the dance studio. The only thing I would suggest improving is perhaps printing the game instructions in a larger font. My old-ish eyes had a hard time reading them. I know it's to keep the paper small so they fit easily into the bag, but I'd take a little extra paper for ease of reading. 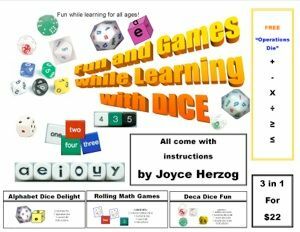 The Educational Dice Bag is available from the Joyce Herzog Products Store for $23. You have to create an account to get into the store, but it's simple to do. The Schoolhouse Crew reviewed several Joyce Herzog products and I hope you'll check them out!